I am currently researching a book on toy boats and although they made small plastic boats post 2ndWW I have not been able to ascertain if they made any tinplate boats in the 1920’30′s. Hi there Roger lets hope we can help you out on this quest – for my part I am aware that Wells produced a tinplate/clockwork paddle boat. This had a permanent key the end of which was shaped as smoke, the key being located in the funnel of the boat. Had a detailed tinprinted deck and superstructure and came with 2 paddle wheels to its sides and a rudder at the stern. Wells also produced a tinplate/clockwork Hydro-Jet Speedboat c1950 which came in red/blue, not sure if it came in any other colourway. Again with detailed tinprinting and a length of c25cm. Lastly I believe they may have produced a friction drive carpet toy of a tinplate battleship in grey with detailed tinprinting although this did have a plastic superstructure to it. As always, apart from the speedboat, dates are always a bit vague and sods law says the one you do know for definate is not of the time frame you need – sorry about that. Hope this is of some use Rog. And if anyone else can shed any light on this subject for Roger then please get in touch I’m sure it would be appreciated. Dave, Thanks for reply, sorry for late response. I have since found an early tinplate boat c.1926 and post-war a printed tinplate boat and a plastic cabin cruiser. What I have noticed ios that c.mid-1950s they had a factory in Holyhead, Anglesey, North Wales. Boats branded as Welsotoys. Nothing else found. Nice to hear from you again Roger, can’t believe its almost six months since your first visit here ! and yes Welsotoys boxes did come with the Holyhead address and again as far as I know came bearing the A.Wells & Co. Ltd makers name but I’ve not really followed that through. I assume your cabin cruiser is the one bearing the model no. 167 with red lower and white superstructure with the plastic key to operate the clockwork motor. Gosh what a cheap looking model that is compared to the early Wells/Brimtoy models ! Hope you’ll keep dropping in with any updates, all the best – David. Dave,I have just discovered your webb site and was wondering if you could help me with a metal toy I was given 55years ago.Its an army style tank,with aclockwork mechanism which when wound up travells a short distance then flips over on its back ,rerights itsself and repeats this movement.It measures about four inches long by two inches high.There is a small makers mark which says made in Great Britain and the letters MAR toys.Any help would be appreciated. Thank you. Hi there i am currently volunteering at a toy museum and am having a bit of a hard time dating a piece and i thought you might be able to help. I believe it to be Wells because of its Balloon tyres and seeing as you seem to know quite a bit about the company you might know when they started producing this type of product. even a guess would be great, all the best! Hi Charlotte, from your description and size it does indeed match that of a Wells tipping lorry. Cream chassis with permanent key, green cab and back with cream lining. Balloon wheels size 5 x 19 and measuring some 26cm in length. You don’t mention it but should come with a tinplate driver-in. Usually dated to pre-war but if you say 1940 you will be there or there abouts. Hope that helps – David. Ian, that flippin’ tank – I wonder if thats what the German Infantryman said when he saw one coming towards him - is usually referred to as a ‘turnover tank’. The maker is actually MARX TOYS. Marx (USA) made a turnover tank No.3 which one tends to see come up for auction more frequently that the Marx (GB) No.5 version. The British tank has detailed tinprinting in red, yellow and green with the number ’5′ prominent to its front face and is fitted with a permanent key. It is also fitted with a turret from which protrude two small cannon pointing forwards. As for value, baring in mind the depressed market, the USA version is the more popular and on average is making around the £30-£40 mark at auction whereas the British one probably half that figure, but as always it depends on condition and who wants it at the time. All the best Ian, hope my description matches your model or you have one I’m not familiar with, David. I have just obtained two Welsotoys telephone money boxes, one blue and one red along with one box. The bodies and hand sets are plastic but the base and internal dividing panel between the money compartment and the clockwork bell mechanism are tin. Do you know if these were produced in any other colours please? Rod, not 100% certain on this but I do think they only came in red and blue colourway. Classed as the ‘Mechanical Telephone Money Box’ by Welsotoys model #9/249. Unfortunately I don’t have a box to confirm this but if you check on yours I’m pretty sure the pictures on the box only show the telephones in those two colours. If anyone knows any different please drop us a line. David., I was interested and pleased to find information about Brimtoy, I lived not far from where they were manufactured in Chingford, this research was prompted because I have in my possession a clockwork car A Bentley type design which I have had since a child early 50′s. It’s in good condition still works well as I have a key. Any idea of its value would be a great help. Hi Paul ….. Not come across this item of yours before, can I ask you to send me a couple of pics which may help me identify it. Ray …. looking through the site and I came across your question minus any respose ! I may have deleted it by mistake … or dare I say not responded in the first place .. heaven forbid ! Without a pic its hard to be specific as Wells Brimtoy produced a couple of limousines which could fit the bill although both came fitted with a permanent key ! so I will generalise if I may. One such limousine was pre-war, was usually found in blue/black colourway and would normally sell for around the £80 – £100 mark. The other one I am thinking of came in cream/blue colourway and was fitted with a tinplate driver. The vehicle roof did not extend over the driver but judst enclosed the rear section of the car. Again this vehicle would sell for a similar amount at auction but as always price is determined by several factors the prime consideration being condition. Thanks for visiting the site, David. Hello Mike, I said some time ago that I would STOP giving price guides but as REQUESTS keep on coming in I will do my best – please bear in mind that it only my opinion and best guess ! Trouble is no two people ever have the same idea as to the condition of an item. What to you may seem excellent to a serious collector may not seem so. The box carries as much value as the item it holds, put the two together and the value rises. Without ‘hands on’ its almost impossible to state the true value of any item but HOLD TIGHT PLEASE and here goes. Almost forgot, don’t forget that prices generally are lower now than at any time for a few years but I would still say that a Brimtoy Pocketoy Trolleybus boxed, in excellent condition, should still make somewhere around the £100 mark. Now I’ve said that and read you question again it has to be in good working order ! so you need to check the motor is working etc. No problem Mike, glad I could be of some help. Graeme hi there, sorry to be a while in answering but had a big birthday, a very big birthday the other week so we went away, not sure if it was to celebrate or to forget it this milestone !! BCM/WELLS good question to which I have no answer just now. To be honest I’ve only come across it on the early train sets. The type face is always in upper case so I’ve always assumed it referred to a company name. Initially I thought it referred back to BMT (British Metal & Toy Manf.) where the ‘B’ stood for British, the ‘M’ obviously stood for Metal but what was ‘C’ ? Then I thought of ‘B’ = Brimtoy but what to make then of ‘C’ & ‘M’ ? Looking at BCM amongst the toy companies doesn’t help much either. BCM at Derby produced cast metal toy space and cowboy guns in the main but they were considerably later. The only reference I have to BCM where the dates would fit were a company based in London, W.C.1. producing board games as British Card Manufacturers. These games carried the printed BCM name along with the name of the game eg : BCM/Sorry & BCM/Carsoc, just as in BCM/WELLS. So is it simply that BCM produced the card boxes for Wells trains, it may make sense as the early boxes carried no makers name for the toy included. If anyone can confirm this or shed any further light on the issue then both Graeme and myself would be delighted to here from you. David. Hello David, I wonder can you help, I have just bought an old Wells Brimtoy `Prince Charming with Cinderella` clockwork toy. The item is complete and working, but there is a crack in Cinderella`s dress (blue with flecking) of about 3 cms in length. I wonder if you might know what sort of (plastic) material was used to make the toy as the nature of the material will dictate how I repair (what filler etc. I use). Thanks very much .. by the by, I have enjoyed reading through your website, all very interesting and you clearly have quite some knowledge of the Wells Company. Thanks in anticipation. This is the first time I have been asked this particular question and to be honest I don’t know the answer ! Early plastics were not very stable, prone to warping etc so attempting to repair these early plastics is no easy matter, filling – rubbing down – colour matching – repainting – plus matching the flecking/glitter takes a lot of time and patience. You will need to separate the figures from the base as the repair will best be performed from the inside to minimise contamination to the outer surfaces. However I have to ask the question everyone else would – why bother ? The model itself is not uncommon so why not simply go out and source another complete model and stand it along side your damaged one. You will appreciate that what little value this models did have will be negated by the fact that it will judged to be in ‘restored’ condition. On the other hand you may like the challenge of bring it back to its ‘former glory’, as for myself I’m at that age Robert where I take the path of least resistance .. in this case it leads to a toy fair and the opening of a wallet ! Best of luck in your restoration and sorry I can’t be of more practicable help, David. Nice of you to get back on this and yes I still maintain the model is relatively common. However in saying that there were several colourways of both the Prince and indeed Cinderella so there will be a good chance that one or two of these multiple combinations will be hard to source. As to which that may be I have no idea as its a question that I have given no thought to .. until now …. maybe someone out there knows the answer ? I’ve seen the BCM prefix (with oblique) on a number of pottery items over the years and was puzzled too. I’ve just had a quick Google search and it turns out that it stands for ‘British Commercial Monomarks’ which, if I understand it correctly, enabled efficient distribution of mail, telegrams, etc. as a unique identification tool relevant to each company that paid for the service. Simply Google ‘British Commercial Monomarks’ for several sites. Hope that helps! Thanks for that Simon. You could well be right on this, looked it up as you suggest and it does make pretty good sense. Its a bit like some Companies today using a particular Postcode which is deemed to be more ‘acceptable’ for their brand than the one in which their company is actually located. It would seem that the BCM idea never really took off as it was hoped and yet it would seem it is still operational and hoping to have a resurgence. Thanks for the Heads-up once again, nice to know there is someone awake out there ! 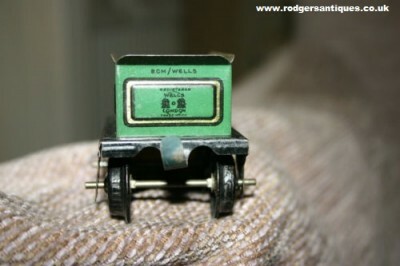 Hi I have just found Cinderella Rail Car in its original box ( box a bit worn ) but in great condition. Can you help with any info please and an approx. value. would it be worth selling in New Zealand or Britain.? The release of Walt Disney’s ‘Cinderella’ in 1950 was the opportunity to launch a raft of licensed products featuring characters from the film. In your case the Cinderella Rail Car Set was produced in the UK by Wells-Brimtoy and came complete in a cardboard picture box. (Pictured for those who haven’t seen this item before). Set comprised a tinprinted 4 wheeled railcar, 21cm., clockwork ‘O’ gauge mechanism which in turn operates the two composite figures of Gus and Jaq with tinplate arms. 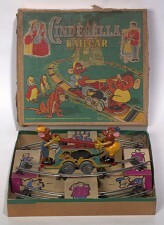 6 x sections of curved railroad track which when joined together form a circle upon which the mouse operated handcar can run. The tail of Lucifer the cat acts as the on-off switch. Although the hand cart turns up from time to time it is hard to find a boxed set regardless of the box condition. As regards value I’ve seen the hand cart on its own sell at auction for just over £100 several years ago. Boxed, I can find records of boxed sets selling for anywhere between £400 – £700 but again nothing in the recent time scale. As regards selling this item, I can see you’re in NZ and some might say with the internet it makes no difference but it will depend how it gets picked up best. I would suggest the toy market is stronger over here and indeed in the States than in NZ. If you are thinking of selling this item I would suggest you take more professional advice and contact the big toy auction houses who will be only to happy to advise. The other option is to go for that well known Internet auction site: list it visible on all international sites, start it at a price you would be happy to sell it for or alternatively at a ‘Buy It Now with Offers’. If I can be of further help just message, all the best, David. I have 2 Wells ‘Mary Had a Little Lamb’ sets, one with a lead sheep and one with a plastic sheep – which is correct? Hi Tony, I think I might sit on the fence a little on this one. I know for certain that Wells Brimtoy produced the plastic ‘Mary had a little lamb’ figure with a clockwork mechanism which had a separate lamb which clipped onto the rear of Mary and was towed behind her as she moved. In every version I have come across the lamb was a DIECAST METAL model, I always assumed that in needed the weight so as not to tip over as it was being towed along. Obviously a plastic lamb would have much less weight and be prone to tip ? However simply because I have not come across a plastic lamb does not mean to say it is not correct. To sum up I would assume the metal lamb as being 100% correct. I have a large car clockwork in the Wells type of drive ,it appears a Rolls or a Bugatti but I only ever seen a blue on web and this is green wi gold litho graph.Has any one seen such a one and is it common ? Hope this is your model, would help me if you sent in a pic with your question. Wells (UK) pre-war tinplate clockwork Rolls Royce. Mid-green with dark green roof and driver in. Overall length of 18cm. A scarce model in comparison to the usual blue as you rightly gather and to be fair I haven’t seen one at auction for a good few years. The ones that came up would normally sell for around double the more common blue version and I would expect that differential to still apply.